Today’s recipe Pheerni is a contribution by a little budding food enthusiast Navya. A twelve years old, she takes keen interest in trying recipes on her own. 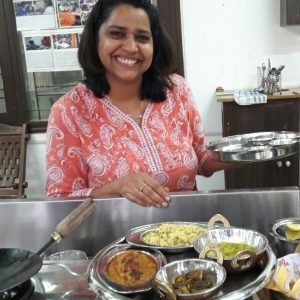 This is her signature recipe and she holds lot of pride in telling about it. This is an easy way to make this beautiful, delicate dessert. Super easy to prep, just needs a night to chill well and then it is ready to serve. For scorching summers this is perfect food to cool your burning digestive system. I prepared it last night, I loved it as my breakfast. As this is the auspicious month of Ramadan I dedicate it to all my guests keeping Roza in this harsh summer. For rest of us, lets enjoy it anyways without any reason! Start heating 1 liter of medium fat fresh milk. Once it starts boiling, take it off the heat. Let it cool for a few minutes, I kept stirring it to not let the cream settle on the top. Then add 1 small cup of sugar ( around 4 tbsp) and add ground cardamoms (4 ). Mix well, and then bring it back to heat. This is ground rice, which will be added in the boiling milk. When you see milk is boiling, add the ground rice mix it well and again take it off the heat. This time also, I kept stirring it time to time to keep it lumps free. Finally, after 3-5 minutes put the mixture back to cooking on a medium heat. It took me another five minutes to get it to thicker consistency. I am not looking for a very thick consistency, it was still good to sip so do not overcook to scoop thickness. Take it off the gas. Let it cool for next 20-30 minutes. If you like garnish it with some sliced almonds, pistachio or raisins. Now chill it overnight for best flavors. I made a Rose flavor Pheerni, so once our mixture is at room temperature I added a little rose essence and very little natural Rose Syrup to give it natural Rose aroma. There is a popular variation in Pheerni – it is saffron. So once you are boiling the mixture and adding Rice, add Saffron (diluted with milk) to make your Saffron flavored Pheerni.